The latest version of the FEMA app is available for free in the App Store for Apple devices and Google Play for Android devices. Users who already have the app downloaded on their device should download the latest update for the reminder alerts feature to take effect. The reminders are available in English and Spanish and are located in the “Prepare” section of the FEMA App. SPRINGFIELD – Nearly 50 weather warnings were issued Tuesday evening across the northern half of Illinois, including 19 tornado warnings. Several tornado touchdowns were reported, resulting in damage to dozens of structures. Fortunately, it appears no serious injuries or deaths resulted from the storms. James K. Joseph, director of the Illinois Emergency Management Agency (IEMA), said yesterday’s severe weather outbreak serves as a vivid reminder that people need to have a way to receive severe weather warnings any time of the day or night, such as with a weather alert radio. Joseph added that Illinois residents currently have an opportunity to win one of 100 weather alert radios to be awarded through an online contest. The ‘Weather Alert Radios Save Lives’ contest, sponsored by IEMA and the Illinois Emergency Services Management Association (IESMA), is available on the Ready Illinois website at www.Ready.Illinois.gov. Participants will be registered for a random drawing for the radios after reading information about weather alert radios and successfully completing a five-question quiz. The contest runs through March 31. Winners will be announced in April. The radios were purchased by IESMA as part of an effort to increase the use of the devices in communities throughout Illinois. More information about severe weather preparedness is available at www.Ready.Illinois.gov. Discover the thrill of saving someone’s life. Well, it may not always be that dramatic but you can certainly make a difference. 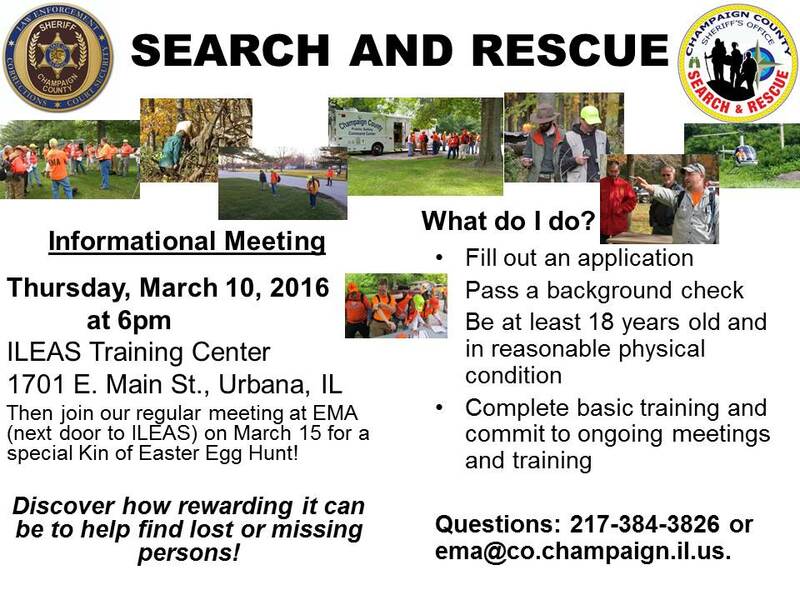 If you love the outdoors and want to make a difference in your community, join the Champaign County Search and Rescue (SAR) team. An informational meeting will be held Thursday, March 10, 2016 at 6:00 pm at the Illinois Law Enforcement Alarm System (ILEAS) Training Center, 1701 E. Main St, Urbana. You must be at least 18 years old and able to pass a background check, but do not need to live in Champaign County. Searchers are called to find missing persons, often elderly people with dementia or children. Trained searchers are two to four times more likely to locate a missing subject than someone without training. The team has monthly instructional meetings discussing everything from how to use maps and compasses to the behavior different types of subjects display when they are lost. There are regular outdoor exercises to hone search skills and to practice the management of a scene. SPRINGFIELD – With communities throughout Illinois still recovering from severe storms and record and near-record flooding in late December, the Illinois Emergency Management Agency (IEMA) is joining with the National Weather Service (NWS) and local emergency management agencies in efforts to help people stay safe when severe weather threatens. Those efforts include an online contest sponsored by IEMA and the Illinois Emergency Services Management Association (IESMA) that offers Illinois residents a chance to win a weather alert radio. The ‘Weather Alert Radios Save Lives’ contest will begin on Feb. 28, the first day of Severe Weather Preparedness Week in Illinois, and continue through March 31. Joseph said 14 flood-related fatalities occurred in 2015, the highest annual number since records have been kept, according to the NWS. All of the fatalities were the result of vehicles traveling on flooded roadways. Illinois also experienced 69 tornadoes in 2015, which resulted in two fatalities and 27 injuries. The weather alert radio contest will be available on the Ready Illinois website at www.Ready.Illinois.gov beginning Feb. 28 and will run through March 31. A total of 100 weather alert radios will be awarded to randomly selected participants who register after reading information about the radios and successfully completing a five-question quiz. Winners will be announced in April. The radios were purchased by IESMA as part of an effort to increase the use of the devices in communities throughout Illinois. IEMA and the NWS developed a Severe Weather Preparedness Guide, which provides information about tornadoes, severe storms, lightning and flooding along with recommended actions to take before, during and after each of these weather events. It is available on the Ready Illinois website at www.Ready.Illinois.gov. Preparedness tips and information are also available through the Ready Illinois Facebook Page (www.facebook.com/ReadyIllinois) and Twitter Page (twitter.com/ReadyIllinois). (Park in lot C4, enter the building in the C1 doorway).